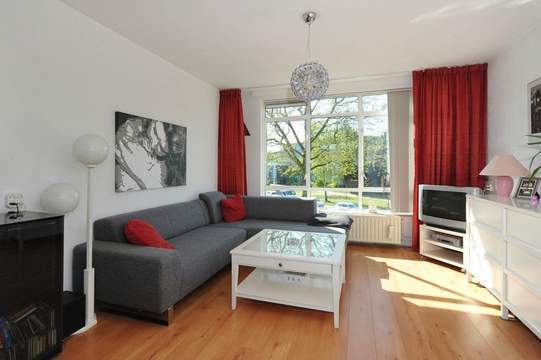 Bright well maintained apartment with 4 rooms in Voorburg, near the office area Beatrixkwartier, station Laan van NOI, public transport and shops. The property is close to highways (A4, A12 and A13). Lay out: Entrance on the 1st floor, hallway provides access to the living, master bedroom, wardrobe room, bathroom and kitchen. Bright living room located on the front side of the apartment. The wardrobe room offers a lot of storage space. The bathroom is equipped with shower, sink and toilet. The master bedroom is located at the back of the apartment, does have a build in wardrobe and does have access to the balcony with a clear view over a green area. The spacious well maintained kitchen is fully equipped with fridge freezer, oven and microwave combined, gas hob and extractor fan. The kitchen provides access to the 4th room of the apartment. At the moment furnished as wardrobe/storage room.